Is the perfume itself shocking? I like to think that what shocking pink is to regular pink, Shocking is to an ordinary floral chypre. It starts with an odd tarragon note which is followed by honey and rose. So far, so good, which is to say — not that shocking. The chypre accord at the end softens and pulls together these three striking and distinct notes. How is this perfume, then, an olfactory equivalent of Schiap pink? It has one foot in the natural world and another in an electric socket that ratchets everything up into a neon simulacrum. The double sweetness of honey and rose almost compete for prominence, and initially make you wonder if sweetness is all there is. Although one Basenotes reader thinks the perfume "smells like the closet of a spinster great aunt who saved every rose corsage and honey jar that came her way," those notes are followed by the civety base that keeps it from being cloying. *CORRECTION: A reader rightly pointed out that Shocking is not E. Schiaparelli's first perfume. 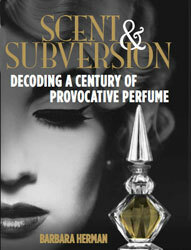 This will be fixed in an upcoming version of Scent & Subversion! Like an art student who wears vintage dresses and library glasses and but smokes and sleeps around — Shocking has a wild streak. Hi there,B, I met you a few days ago with Galladrielle in Napa. We talked briefly about a perfume that comes in the shape of a dressform and I think that "Shocking" might be it. It seems that after reading reviews that there it a big difference between the original formulation and the current. So my question is what is a good source for hopefully a good quality vintage perfume? And do you have any advice on buying vintage perfume. I love your webpage, you write so well, the only problem being is now I want to try them all!!!!!! !really nice meeting you and look forward to hearing from you, kennedy. ps thanks for the pictures. . .
Hi Kennedy! Glad you liked the pictures, and thanks again for driving. It was fuuun! Estate sales, Goodwill, flea markets are also good ways of getting vintage. Just make sure you know what the going rate is for a particular perfume so you don't spend too much on it. If the seller on eBay is reputable, he or she will have a good score. Before I buy, I usually ask them if the perfume still smells good, and if they're good sellers, they'll tell you if the perfume smells weird or looks dark. If it's still in its box and has been stored away from light and heat, that's a good sign too. If you don't want to invest in a bottle, The Perfumed Court is a good way of spending a few bucks on a small sample of vintage. Here's the rub, though: you will pay about 5 - 20 dollars for a 1 ml sample, and depending on the perfume and its rarity, you might be better off paying an extra $15 or so for a whole bottle or mini bottle. Hope that helps. It was nice meeting you too! Waar kan ik de parfum kopen van Elsa Schiaparelli SHOCKING kopen?